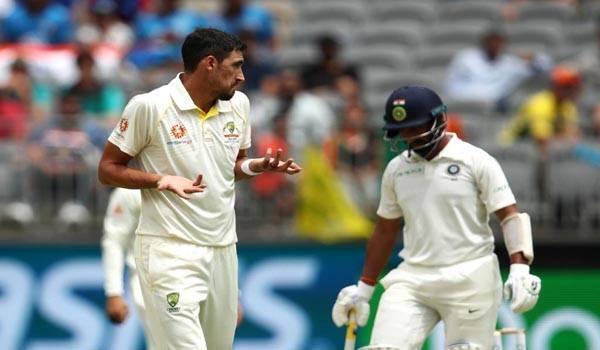 Melbourne: India were on 54/5 at the stumps as the hosts fought back with quick wickets in India's second innings on Day three of the third Test here at Melbourne Cricket Ground (MCG) on Friday. Pat Cummins picked up four big wickets in Hanuma Vihari (13), Cheteshwar Pujara (0), Virat Kohli (0) and Ajinkya Rahane (1), while Josh Hazlewood dismissed Rohit Sharma for five. With a lead of 346 runs, India eyeing a crucial 2-1 lead in the four-Test series. Debutant Mayank Agarwal (28 batting), scored an impressive 76 in the first innings and Rishabh Pant (6) were at the crease. Earlier, riding on Jasprit Bumrah's fierce bowling, India bowled Australia for 151 runs, taking 292 runs lead in the first innings. However, India did not give Australia follow-on.Bumrah bagged six wickets for 33 runs, the best performance by an Indian fast bowler against Aussies. This is also his career best performance in Tests, bettering the 5/54 which he claimed against South Africa at Johannesburg in January. Tim Paine (22 not out) and Marcus Harris (22) were the high-scorers from the Aussies side.Earlier, the hosts resumed their innings at 8 runs for no loss. Ishant Sharma gave India its first breakthrough as he dismissed Aaron Finch for 8 runs. Then, Bumrah dismissed Marcus Harris for 22 runs, reducing Australia to 36 for 2 in 13.3 overs.Usman Khawaja (21) and Shaun Marsh (19) got good start but failed to convert those innings in big scores. Spinner Ravindra Jadeja, who replaced Umesh Yadav in the Melbourne Test, dismissed Usman Khawaja to keep India on the top in first 20 overs. Khawaja looked promising for Australia as he scored fearless 21 runs off 32 balls, including three boundaries. Just before the end of the first session, Bumrah came stronger and trapped Shaun Marsh (19) LBW to leave Australia reeling.